Collecting mementos over the years is commonplace. Accumulating stockpiles of garbage, decayed food and faded newspapers is a dangerous extreme. The latter scenario indicates in the individual the neuropsychiatric condition known as hoarding. 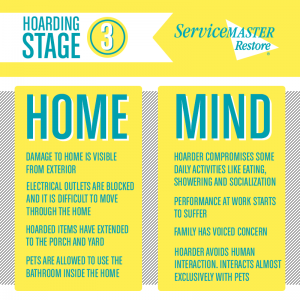 Worldwide, two to four percent of the population is affected by a hoarding disorder. Previously seen as a symptom of obsessive-compulsive disorder, a hoarding disorder is a distinct mental condition. In 2013, the Diagnostic and Statistical Manual from the American Psychiatric Association gave hoarding disorders a diagnosis all its own. The holidays may be an especially difficult time for hoarders due the depression and anxiety involved with the disorder. If you have a friend or family member who you suspect of hoarding, check in on them during the holiday season and see if you can help them. If you are visiting senior relatives during the holidays, you should check their home for signs of hoarding as this is somewhat common among seniors. Reaching out to a hoarder, even if they are not ready to clean their homes, can bring them some holiday cheer. People with hoarding disorders can be helped with mental health treatment. However, convincing someone who hoards that they have a treatable problem requires skill and patience. People who allow meaningless items to haphazardly accumulate do so out of compulsion—not laziness. Those who hoard experience gnawing feelings of distress and anxiety at the mere thought of throwing out any of their possessions. A home filled with neatly displayed glass cases of thousands of miniature porcelain figures is a collector’s haven. The homeowner feels pride and joy in showing off their collections to neighbors, friends and family. In stark contrast, a person suffering from a hoarding disorder accumulates massive amounts of noxious junk. Guests are rarely allowed into the home, since the hoarder fears their hoarding tendencies will be exposed. People with hoarding disorders often are financially distraught, because they spend so much of their income purchasing useless items. Stockpiling boxes of worn spatulas and housing dozens of feral cats has no value for the average homeowner, unless it is to satisfy hoarding inclinations. Before confronting a person with a hoarding issue, take care to seek the support of local hoarding task forces, community coalitions or even online hoarding groups. Virtual hoarding support groups may include therapists, family members of people with hoarding disorders and hoarders themselves. Hoarding is a severe addiction, and the addict will attempt to draw in concerned people to escape responsibility for their condition and choices. A friend who suggests that a hoarder should toss their stuff will only be met with obstinate refusal. Rather than judge the individual and the overwhelming clutter, empathically discuss the harm that results from hoarding. 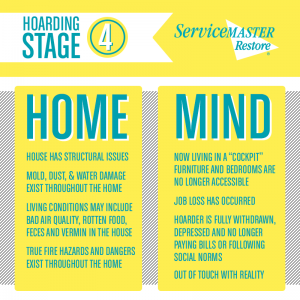 Openly talk about how the hoarding activities put the hoarder’s safety and health at risk. The home of a person living with a hoarding disorder should never be cleaned without the hoarder’s implicit knowledge and approval. Cleaning up the house without permission only breaks trust and destroys relationships. Consequently, the individual with the hoarding issue will be disinclined to seek out help in the future. Plus, cleaning the hoarder’s home without a mental health treatment plan in place is ineffective. People with family members who suffer from hoarding problems liken the situation to pouring an alcoholic’s liquor down the drain. Temporarily, the issue appears resolved. Long-term, the matter remains unresolved. Most sufferers of hoarding disorders only partially recover. Typically, a combination of medications and cognitive behavioral therapy is effective in reducing the effects of the condition. Effective treatment includes not only medications, but additional support resources, like therapy groups. Clinicians with expertise in the field of hoarding disorders may be located through the International OCD Foundation’s database. Full recovery from a hoarding disease is possible. Medical professionals have seen instances where individuals receiving treatment for hoarding disorders have fully recovered and no longer experience the compulsion, for the remainder of their lives, to clutter their homes with junk. Once the individual living with a hoarding disease accepts help, it’s time to clean up the mess. Independently discarding the massive piles of junk is dangerous. Waste contaminated with harmful pathogens makes the cleanup hazardous. Mountains of possessions teetering toward the ceiling can fall, injuring those who help clean up. Friends and family who do choose to help tidy up a hoarder’s home should be armed with a fire extinguisher (to douse the innumerable flammable materials in the event of a fire), a flashlight, pest repellants, a first aid kid and a dumpster. Start small. First, eliminate the refuse from a single room, like the bathroom, to gain access to running water and cleansers. Incrementally work toward cleaning up the entire home, taking care during each phase to consult the hoarder about keeping family heirlooms or possessions with sentimental value. Reusable items may be donated. Ensure that donations are clean and safe to reuse. Check the local ordinances for instructions for how to properly dispose of waste material, medicines and explosive materials. Once the home is sanitized and thoroughly rid of waste and excess possessions, regularly follow up with the individual with the hoarding disorder. 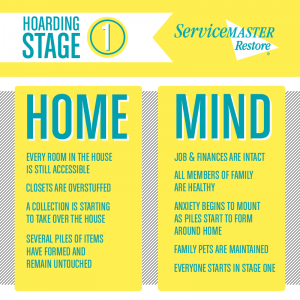 Create a maintenance schedule for the hoarder to follow. Visit the premises often to ensure the home is habitable. 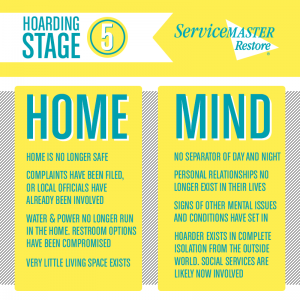 When confronting an individual with hoarding disorder, you’ll benefit from the services of a professional hoarding cleanup service, like ServiceMaster DAK. Cleanup services include the recovery of valuable items, like photographs and mementos. 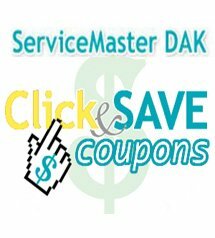 Technicians from ServiceMaster DAK eliminate pungent, unpleasant odors that result from decades of hoarding. Our trained professionals are prepared to handle dangerous microbes, bacteria and toxic materials professionally and expertly. We will also properly dispose of waste according to local laws. 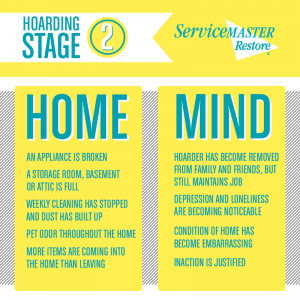 ServiceMaster DAK’s experts treat each customer suffering from a hoarding disorder with compassion and sensitivity when handling the cleanup. Our experienced technicians take the time to build trust with the individual with the hoarding disorder and include them in decisions to throw out possessions. Once the hoarding cleanup is complete, ServiceMaster DAK technicians follow up by phone and schedule maintenance cleanups. ServiceMaster DAK has successfully cleaned and sanitized homes located in Illinois’ North Shore and Northwest suburbs. If you know someone who is ready to clean out their home, don’t hesitate to contact northern Illinois’ most trusted hoarding cleanup company, ServiceMaster DAK.